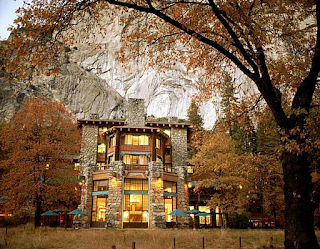 I clicked on SF Gate yesterday and saw a link to an article about the Ahwahanee Hotel in Yosemite. The hotel was built in 1927 and is scheduled to undergo some major rehabilitation making it more earthquake safe and more energy efficient. I immediately recalled the one and only time I've been there. Which was 3 summers ago. Don, Elli and I went to Yosemite in 2006 for four days. We were there for a short little vacation and to celebrate our anniversary. 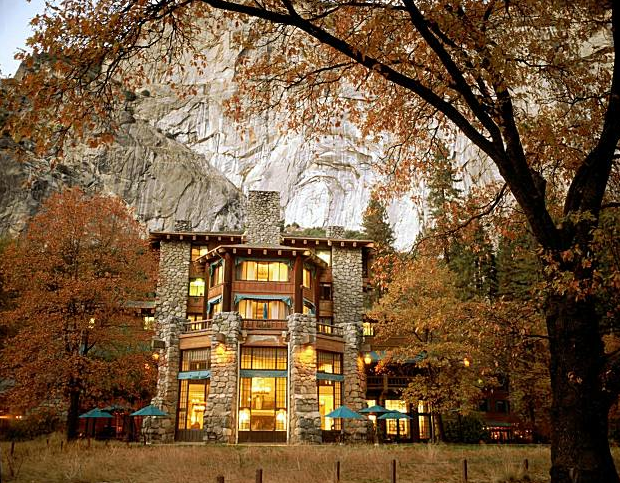 We didn't really know much about all the details of Yosemite until we got there. So once we saw the gorgeous Ahwahanee Hotel and Restaurant we knew we wanted to dine there for our anniversary dinner. We called for a reservation. They were totally booked. They could squeeze us in at 5:30pm. Not exactly what we had in mind, but ok. There was just one more, teensy, weensy problem. They have a dress code. Here we are, in the waterfall hiking capital of California, where sturdy shoes, backpacks and shorts are the dress code. Who would think that you needed to pack dress clothes? Well, the Mulkey's didn't. So now what? Now don't get me wrong, I'm all about being appropriately dressed for dinner. Nothing irks me more than seeing people in sweatpants in a nice restaurant. However, this is Yosemite. Not San Francisco. So we did our best to look nice. I wore capri's and a shirt and Don wore a nice collared shirt and shorts. We held our breath as we walked in, only to be abruptly stopped by the hostess. "You can't come in. You'll have to change." she says. Oh No. This is not good. She told us unless we changed, we couldn't dine with them. Ooooooooh. This made Mr. Mulkey very mad. He threw a stink. They finally gave in and sat us in a corner behind a plant so no one could see us. Seriously. They did. Our waiter did his best to patch things up with us. But it was a little too late. We should have just left. Because it really spoiled the mood of the evening. Plus the "booked" dining room was actually empty at 5:30pm - which just added fuel to the fire. I tried to cheer up Don which was like pouring lighter fluid on a flaming building. Not a good idea. I couldn't tell you what the food tasted like. I remember it was expensive. That's about it. So I hope with the remodel/refresh they are doing they reconsider the ancient practice of "dress codes" and let people enjoy their $$$$ meal in casual attire. Because I am not bringing slacks and a blouse to Yosemite. That's CRAZY!!! I never knew that! They SOOOO need to update that policy. Gimme a break. I do love the idea of seeing you in a "blouse" and slacks in Yosemite though -- hee hee hee.